Your dentures should feel like a natural extension of yourself. The right dentures should enable you to do more. 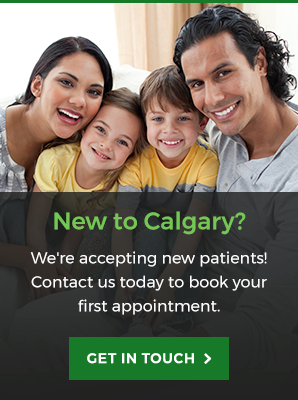 With our in-house denturist, Go Dental in Calgary provides partial, complete, and implant-supported dentures to fit the unique needs of our patients. A denture can be classified as any type of dental prosthetic that returns function and/or appearance following tooth loss. Many denture-wearers try to classify one type of denture as being superior to another with little experience to back them up. A vast majority of denture-wearers have never been served by a denturist that takes the time to schedule follow-up appointments to ensure a proper fit. The best type of denture is the one that best conforms to your level of tooth loss and provides the most comfort. Complete, Partial, Implant-Supported — Which Denture is Right for You? Dentures are often grouped into three categories: complete dentures, partial dentures, and implant-supported dentures. Whether you’re missing one, several, or all of your natural teeth, the denturist at our Go Dental office in Calgary can help you to regain your appearance, bite function, speech patterns — and yes, even your confidence! Partial dentures, also called “removable dental bridges,” are typically prescribed to patients with several missing teeth. Partial dentures use a metal frame to keep them stable and in place. The base of the frame is a pink-coloured acrylic that should blend in with the natural colour of your gums. As the name suggests, complete dentures are often recommended to patients with no remaining upper or lower teeth or those planning on having full rows of teeth removed. In these situations, complete dentures can provide immediate results. For cleaning and comfort purposes, most types of complete dentures are removable and are easy to maintain. Full dentures have come a long way from years past and are now more comfortable, aesthetically pleasing, and more useful than ever. Implant-supported dentures use a titanium root device that is surgically implanted into the jawbone. Once the titanium root is in place, a dental crown or denture can be placed on top. If your goal is to obtain the most natural appearance, function, and feel, implant-supported dentures are truly a wonderful option. But, they’re not for everyone; only patients with minimal bone loss, or “resorption,” in the jawbone are ideally suited for this type of procedure. Our denturist can recommend the best type of denture to resolve your condition. Give us a call today to schedule an appointment.